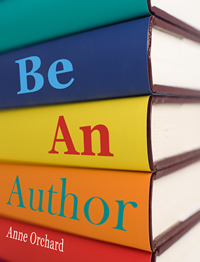 Be An Author is not a ‘how to’ book – it’s a ‘what would it be like if …’ book. In its pages you may just find what you need to inspire and motivate you to fulfil your potential as an author. If you’d like to be in with a chance of grabbing a copy for yourself, all you need do is leave a comment at the end of this post. Last year I stepped into the world of publishing other people’s work for the first time through my publishing imprint Crystal Clear Books. The book is called Be An Author: What would it be like if you write your book? and it’s by Anne Orchard. Those of you who have been visitors for some time may well remember that Anne featured in the Thursday Throng last year with her first book, Their Cancer your Journey. How do I know if what I have to say deserves to be published? Should I try to find a publisher or self-publish? What might life be like after my book is in print? What is a reasonable goal for my book, and can I achieve it? How on earth will I find the time to complete my book? Be An Author addresses these questions and more through a series of interviews with other authors, just like you, who are writing and promoting books today. Some of these authors are published others are self-published, what they have to say about the experience is both enlightening and encouraging. to be an author… that’s a thought. There’s an old martial arts saying, the thought proceeds the action, then through practice the thought becomes the action. wanna publish my zombie story ? I wrote a friday fictioneers serial that I thought I could flesh out. I have 30 or so 100 word storyboards to look at. But is it scary… sometimes. So that’s about 3,000 words – the ideal length for an Amazon short priced at 99c. Why not string them together and we’ll have a look at putting them up into the wider world – not published by me as I’m concentrating on women only – but I’m happy to help you work through the process Bill. Congratulations fellow new publisher! I love seeing my authors books come out and I love when I’m able to offer them a contract! I like this unique twist to an author’s life! I think I’ll have to have a look! Sounds like Anne is paying forward. I have her book on my kindle I just need to start reading it. One of these days we’ll automatically imbibe any books we download without having to go through the act of actually reading them LOL – at least that’s my nightmare horror version of a post apocalyptic world …! I wouldn’t mind my thoughts coming out automatically on paper or electronics so I can catch all those great thoughts that slip away.